Insect damage on tomato crops (especially those grown under glass) are a familiar sight, along with the culprits that inflict it. However flea beetles tend to go unnoticed and therefore undisturbed, and as such rarely make it onto the radar of even the experienced gardener. Flea beetles are a skittish pest and are able to create a lot of damage while - on the whole - managing to get away with it scot-free. Why, well it's because of their size and speed, a flea beetle is not much more than 1 mm in length but it can jump approximately 30 cm in distance in a single bound. This being the case, as soon as you are close enough to see one, it would have already hopped off, disappearing into the undergrowth. Because of the flea beetle ability to disappear fast the culprit behind such damage is often miss-identified. 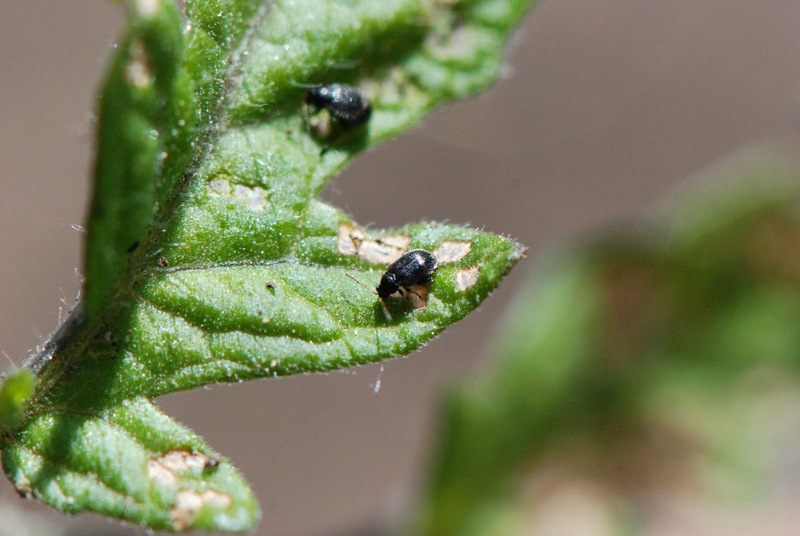 Cause: Even though these tiny, fast moving insects are difficult to spot, they are perhaps the most easily recognised pest of tomato plants due to the characteristic damage that these beetles cause. Control: Flea beetles are difficult to control as they have a habit of ‘hopping’ away if disturbed, making contact insecticides a bit 'hit and miss' in their application. However, you can also consider 'trap crops' such as radish which may help lure the flea beetles away from your treasured tomatoes. So long as the radish is not in flower (as the applied insecticide will then harm beneficial pollinating insects) you may wish to use a systemic insecticide, however this will make the radish crop inedible. With this in mind, remember to label it clearly to prevent human ingestion.